The much-tweaked Parafoil kite was ready for yet another test... Arriving at the flying field, I stepped out into plentiful puffs of breeze. The kite's twin central keels had been removed since they caused problems in fresher wind. 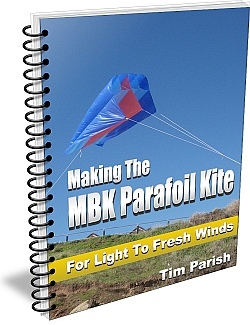 Today, the MBK Parafoil kite was back to 3 identical keels at left, center and right. The towing point had been shifted further forward too. This was done by extending the leading edge of all the keels straight down at 90 degrees to the under-surface of the kite. There was a lot of smooth mid-level cloud about today, although weak sunlight was still getting through. The breeze was measured at 7kph and gusting to 12kph near the middle of the field. But it was something of a quiet patch. Much fresher gusts could be seen ruffling through tree foliage at various points round the field. Also, this location is noteworthy for having a rather sharp wind gradient at times. That is, the breeze can jump in strength rather suddenly as the kite gains height! 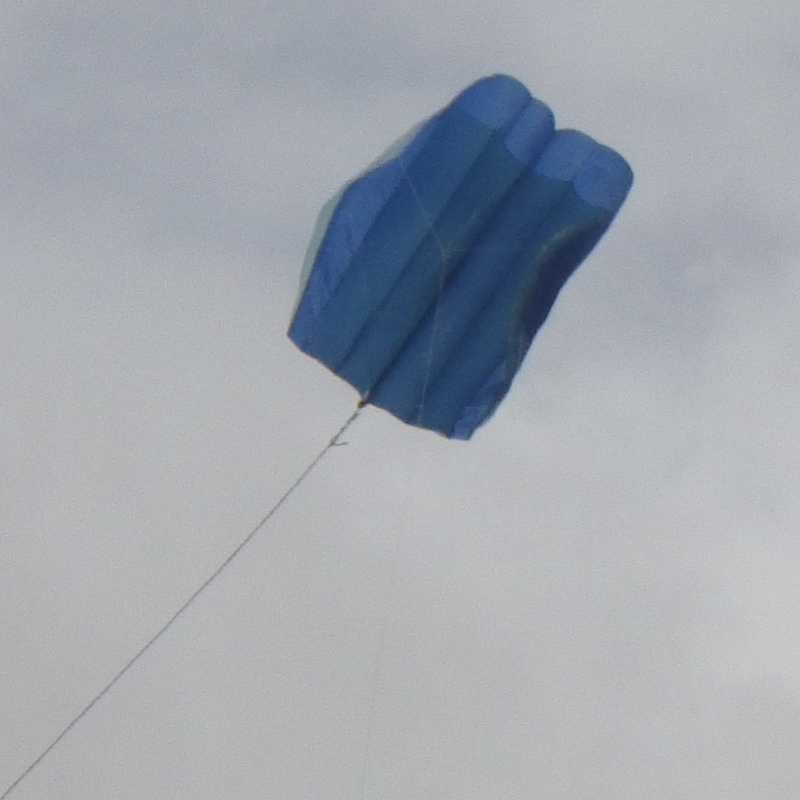 The kite was briefly flown with no tail or drogue but it was clear that today's conditions didn't suit that approach. Even though the kite managed to re-launch itself off the grass on one occasion! However, there did seem to be much promise of stable flight in lighter or smoother winds. 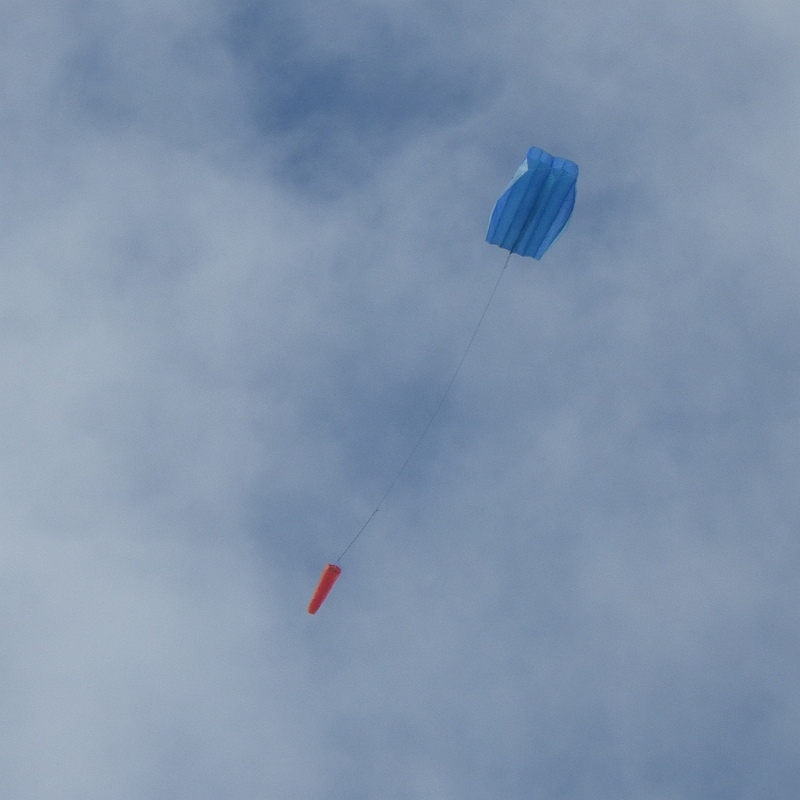 For a while, the kite was hand-flown on about 30m (100ft) of 50 pound Dacron line. Some of the turbulence up there had sudden effects on the kite. The line tension would go hard for a moment then back right off, causing the parafoil to drop its nose and semi-deflate before pressure finally came back on again. With the winder under-foot, some photos and video were taken. The rough air was not just the result of trees and buildings upwind... Not with the kite more than 50ft off the ground, you wouldn't think. The trees upwind were not very tall at all. On a whim, another wind reading was done. Now the breeze was 15 kph and gusting to 18kph. Up higher, there were wind gusts into the high 20s according to nearest weather station. Eventually, about 75m (250ft) of line was out and I passed the winder around a large tree trunk just 3 times. That was sufficient to hold the line firm. Earlier, I had whipped out the spring scales and saw that the line tension was never going over just 2 kilograms. Twenty-pound line would have been quite acceptable! With the line secured, some camera work was done from a small rise in the ground, about half-way out to where the plastic-and-tape Parafoil kite was hovering. By now the sun was out with somewhat more intensity. The kite was hovering quite close to the position of the half-full moon. Also, by standing near the tree, the flying action was framed by some twigs and leaves. Throw in some cloudy background and the result was quite a nice little video clip. Particularly as a gust came through and pushed the MBK Parafoil way higher after almost completely circling the moon. 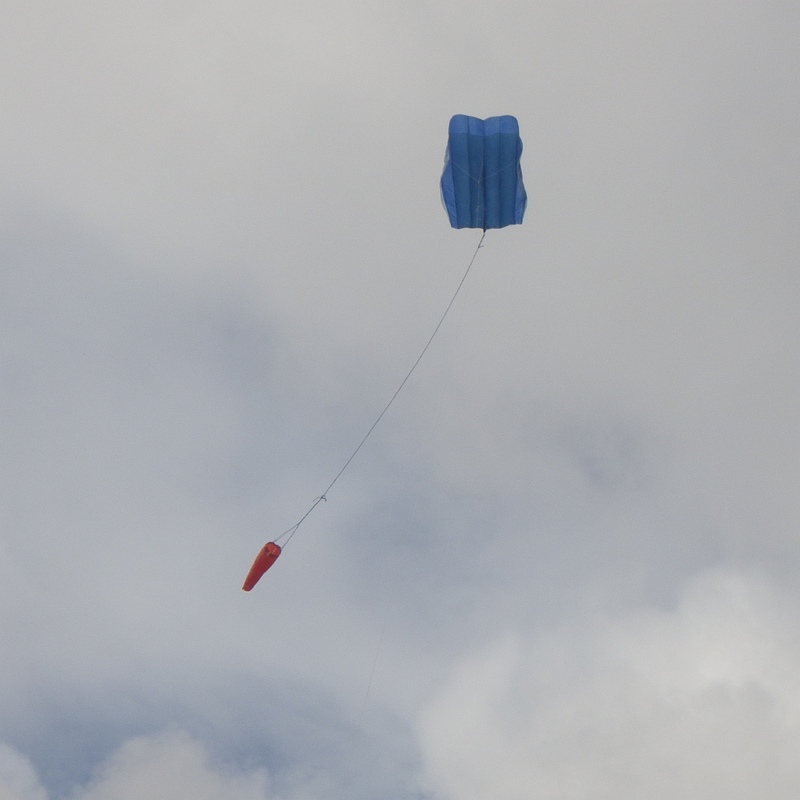 The drogue did an excellent job of keeping the kite into wind, despite some quite rough air. A slightly smaller drogue would have probably sufficed. Anyway, it was satisfying to see the MBK Parafoil kite flying smoothly with no collapses or excessive wiggling from side to side. 'Like a bought one' as they say!